With TONSTURM Mountain Air you get 25 Soundfiles in 5 Channel Interleaved Surround Format. 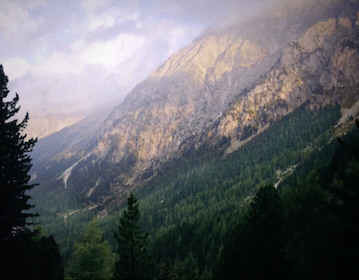 All the ambiences were recorded in the beautiful alpine mountain nature of Tyrol and Austria. The files have a duration from minimum 02:00 minutes up to 05:00 minutes. All the files were recorded with a four channel discrete wide omni surround setup. During mastering we generated an additional center channel for convenience. If you leave the center channel away you have the discrete four channels as recorded. Tonsturm Mountain Air is also available as Stereo Ambience Pack. For our first ambience sound pack we carried a quiet heavy surround recording rig through the beautiful alpine mountain nature of Austria and Tyrol. The rig consisted of four omnidirectional Sennheiser MKH 8020 microphones, four single mic stands and a Sounddevices 788T multichannel recorder. We wanted to capture this impressive landscape as open and wide sounding as possible . Through the four individual mic stands we were able to realize a big distance between the individual microphones. The spaced distance and the omnidirectional pattern of the MKH 8020 were the key to the very pleasingly diffuse, wide and open sound field of these ambience recordings. We also chose the MKH 8020 for their very low self noise as we had to be able to capture very quiet and subtle sounds. The sounds will suit perfectly in a lot of situations where wide and pleasing nature ambiences are needed. Pure air recorded in the mountains at night for example might be the perfect foundation for designing the background tracks of a project. For sure we carefully edited the metadata to give you as much information as possible about each ambience and where it has been recorded.